I think this is a late 1860's bodice altered in the 1870's, or it just could be an 1870's bodice altered in the 1880's!! Sorry I cannot be more specific. One of you will know! My camera does not 'do' purples very well, but this silk is a true deep purple - a lovely colour. 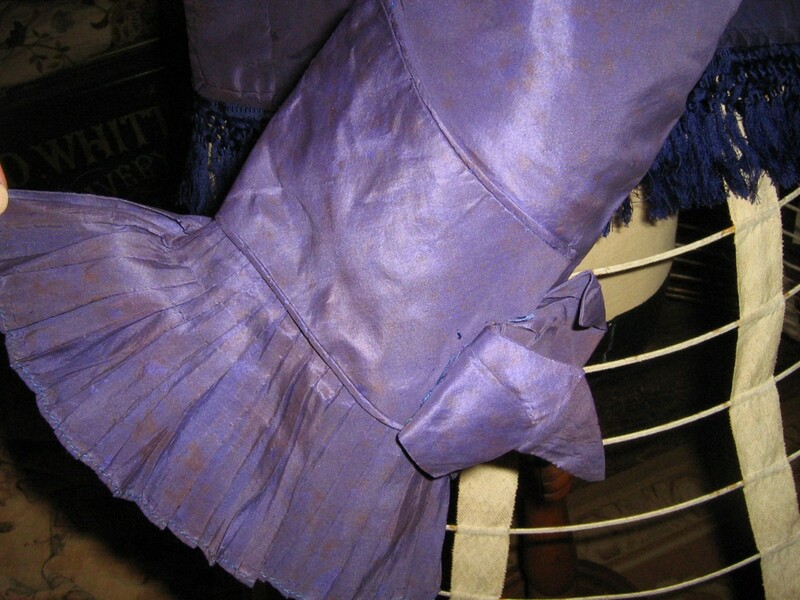 At first I thought that the blue fringing to the whole of the base was a later addition, but when you see the buttons, they are a gorgeous purple silk with blue diamond shaped centres, so I truly feel that the colour contrast is deliberate. In addition, some of the stitching is blue - I really don't know whther this is original or not. 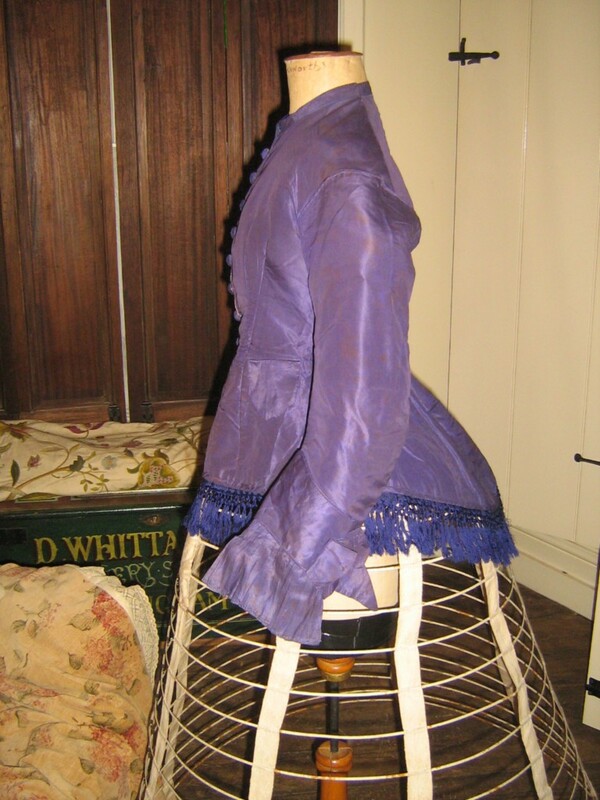 The bodice is very fitted and spans out at the back to accomodate an 1860's crinoline, as shown, or an 1870's bustle. Very low over the hips and very full. Lovely! However, to me the joy of the piece is in the sleeves, fitted to a deep, deep cuff with a large bow at the back of the cuff, and then further decorated with tightly knife pleated flounces. The original sleeves finish underneath this flounce. Internally there are four short bones on a cream glazed cotton lining. The entire inside lower hem is pure cream silk to finish the inside beautifully. The underarms are creased but very good externally. The lining under the arms is slightly stained. 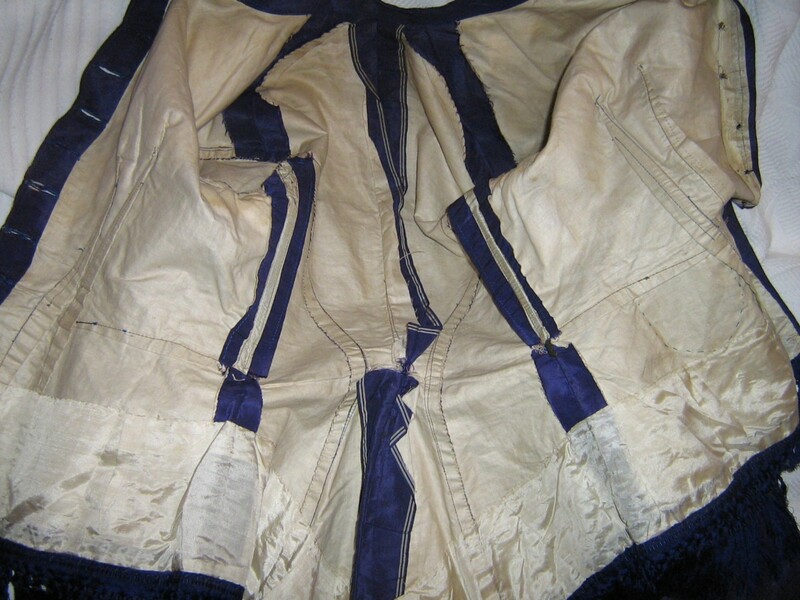 Most of the silk is stable, with an overall strong appearance, but this is through good care - there is very minor splitting here and there, including the front fold edge and several splits to the pleated cuff flounces. Obviously if these became worse they could be removed in the future as the original sleeve is still there. So I would say that the silk appears much stronger than it is. A little watch pocket has been added to the front - I don't think it was there originally. The bodice has been taken in a little at the waist and darts. Minor. As you can see, the main issue is overall muted discolouration to the silk. Now, in Poppy Cottage the light is quite unique! This means that I can only tell you what I see. In daylight, the discolouration can be seen. In standard electric light in the evening, they cannot be seen at all. Obviously under my flash camera they can be seen again, as the flash shows up all faults at their worst. The discolouration could be staining, but I think it may be instability of the purple dye. 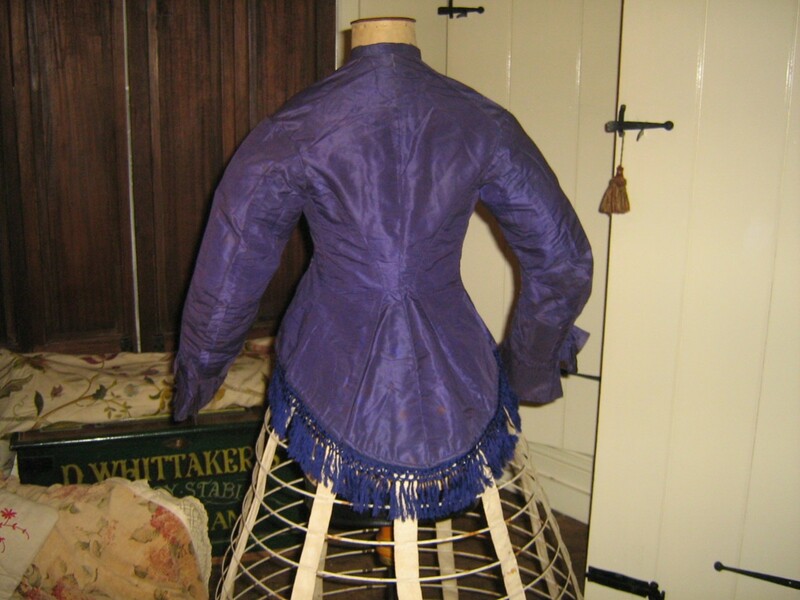 Purple was still quite a 'new' colour in the 1870's so perhaps not as stable as it became as the years went by. Worth trying to give it a steam but I don't think it is strong enough to dry clean - it will shatter. 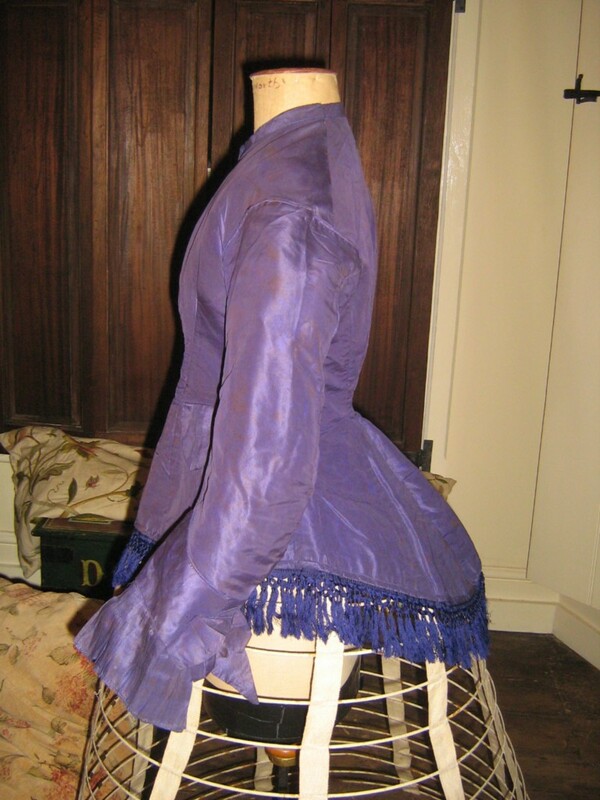 Chest a tight 32" and waist 24"; much better on a half mannequin for a glorious display with accessories of your choice!